Married to Miss Gabrielle Ray on Friday last: Mr. Eric Loder. 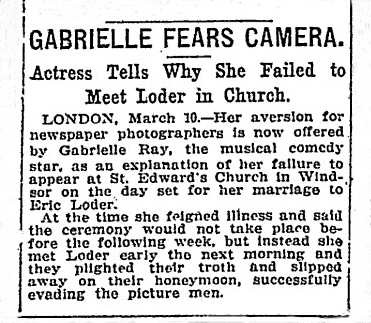 Miss Gabrielle Ray and Mr. Eric Loder were to have been married on Thursday last, but at the eleventh hour the wedding was postponed, owing to the indisposition of the bride. It took place next day, at Windsor. The marriage of Miss Gabrielle Ray, the musical comedy actress, to Mr Eric Loder, which was to have taken place at Windsor Roman Catholic Church yesterday, was solemnised there this morning. The bride motored from London with a lady friend, only a few people being present at the ceremony. The parties reached the church by the vestry door through the rectory grounds, and so escaped public gaze. When the couple returned to the Rectory, Mr Loder shielded his bride with an umbrella from the photographers, though two snapshots were taken. Mr Astley was best man. 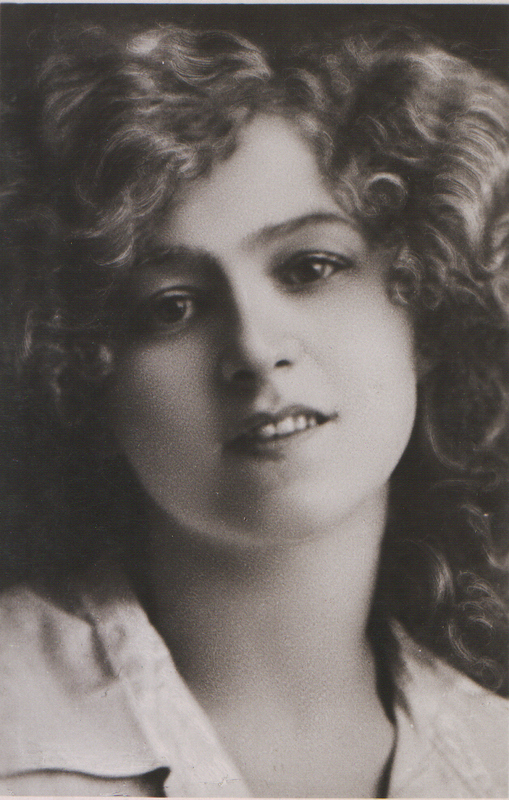 Miss Ray wore a cream costume with mauve hat. The service was choral, and the register was signed Eric Raymond Loder (23), independent means, and Gabrielle Elizabeth Clifford Cooke (28), spinster. After luncheon at the Rectory the bride and bridegroom left by motor car. Marriage takes place at Windsor. 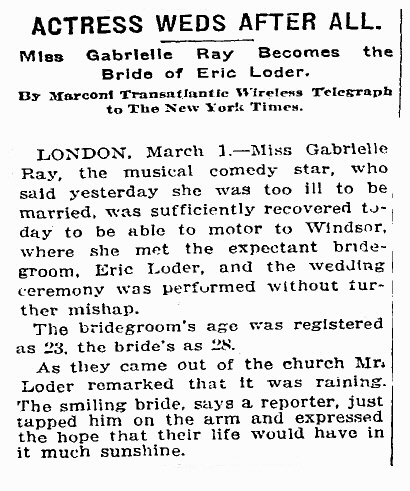 Today the wedding of Miss Gabrielle Ray and Mr. Eric Loder, postponed from yesterday afternoon, took place at St. Edward’s Roman Catholic Church, Windsor, shortly after eleven o’clock. 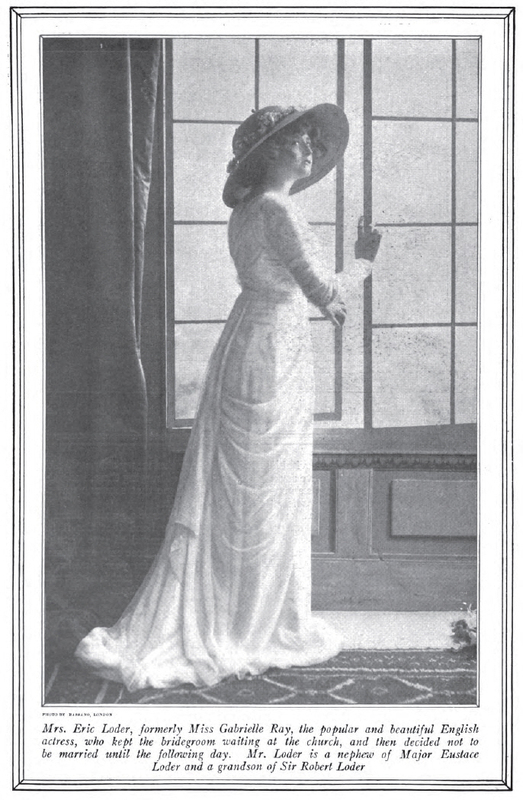 The bride, who was attired in a cream serge costume and a mauve hat, carried a bouquet of violets. There were not more than a dozen people in the church, including choir boys and some children, when the ceremony was solemnised. Before the ceremony the bride and bridegroom sat in chairs in front of the alter, and when the ceremony was commenced they advanced to the alter rails. The organist played wedding marches at the commencement and close of the service. After the service the bride and bridegroom drove away in a motor car. Windsor, for her marriage to Mr. Eric Loder.